There are several factors to consider in choosing the appropriate trash and recycling receptacles for your city or town. The follow are concerns or factors that we have heard from customer over the years; style, shape,Physical size, capacity, color, durability, serviceability, security, wind, precipitation, location, price, recycled content, liner, replacement components and shipping. Style can be very important to your streetscape. A receptacle style that matches and adds to the areas style or scheme should be considered. Shape may need to be considered for the location and other site furnishings in the area. Modular — or “universal” — receptacles and bins would be perfect for a corner-spot, where other more traditional bins can’t reach. Physical size is very important for several reasons. Depending on the area the receptacle will be located. Factors to consider are the amount of foot traffic and maintenance such as snow removal, cleaning and parked vehicles doors. One of the most important factors is capacity. The receptacle needs to be sized to the amount of foot traffic and the proximity to businesses that product more trash, i.e. fast food, coffee shops, etc. Closely related to capacity is location. A receptacle needs to be in areas of high foot traffic. The receptacle can also be close to a business that produces large amounts of waste so long as it doesn’t interfere with foot traffic or impedes the accessibility of any other service, e.g., wheelchair ramps. Capacity is also critical to the department of Public Works scheduled maintenance. The real challenge is using a large enough receptacle to prevent overflow and not create a weight issue for those how must empty the receptacle. One solution is a dual receptacle with recyclables and trash or both trash receptacles. 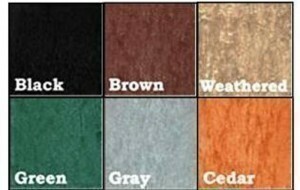 The color of each receptacle needs to accent other area items, such as your benches, light posts, and planters. You should consider a color that does not show dirt. Black is by far the most popular color for receptacles; however, as we mentioned before, you should take in consideration any universally accepted color codes, such as blue for recycle bins. Durability can be critical depending on where and how the receptacles are to be used. If the receptacle is to be anchored down or depends on its weight to keep in in place. What type of abuse the receptacle may see over its expected life. Serviceability is extremely important on so many levels. The location can dictate the need capacity however weight must be considered when emptying the receptacle. If a location calls for a very large capacity receptacle a side access unit can greatly reduce the effort needed to empty the unit making for happier workers and less injuries. Security of the receptacle and components as well of the contents in certain applications need to be taken into consideration. The receptacle is typically anchored and the top cabled to the receptacle. In some areas anchoring theliner or using a lockable side access receptacle can help with the issue. Wind is typically only a concern with very light duty receptacle, such as the expanded metal units, or in extremely high wind areas. Anchors can be used in both cases to overcome this problem. Precipitation needs to be considered for several reasons. The weight when emptying, and spilling during handling and compacting onto the sidewalk and street. Also a concern is water filling the receptacle allowing the waste to float out onto the street. Price is always a key factor with any public purchase. When purchasing a city receptacle every key point noted in the article should be considered. Recycled content is very important to all of us for the future of our cities and towns. When we think recycled content most people think of plastic and it true most recycled plastic is made of plastic bottles and jugs and a very good choice. However it is not commonly known that steel is the most recycled material in the world. Latest studies from the Steel Scrap Institute reports 67% of produced steel in the U.S. is from recycled materials. Linersare the inner receptacles that typically contain the waste or recyclables. Many liners are thin walled plastic units. These are easily broken in cold temperatures and tend to wear out quickly. The OCCOutdoors rotary molded liner is typically twice the thickness and rarely needs to be replaced. The availability of replacement components should also be considered if a component is damaged, or stolen. OCCOutdoors has a stock of all receptacle components. » The number of units order. There is minimum pick up and drop charge from the fright companies. The more you order the more this cost is distributed. » Shipping location, the lowest cost is a business with a dock of fork lift; otherwise a lift gate charge is common. Also residential and constructions sites are considered limited access and result in addition charges. Need Durable, High-Quality Trash & Recycling Bins? Visit the links below and find the perfect one for your outdoor/commercial facility! MAde in the U.S.A! Whatever you call these recycling bins — custom, modular or universal — these are a great way to solve nearly any recycling requirement. 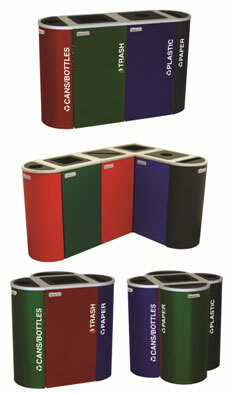 The OCCOutdoors’ modular recycle bins can be configured into hundreds of shapes and labels, with multiple capacities. And each is available in four colors: black, blue, red and green. Modular systems have several shapes and sizes, starting with 8-gallon half round, 17-gallon rectangular, 24 and 36 gallon square recycle bins. Each unit comes with your choice of recycling top, paper, cans and bottles, plastic or trash. These units can be combined to create the ideal solution for nearly any need, limited only by your imagination! The most common are inline, the corner “L” shape and “T shaped. How would you set-up your modular bins? 1. Always place trash receptacles and recycle bins within eyeshot of each other. A trash-recycling combo is preferable. 2. Keep both receptacles emptied, so there is room to add waste or recyclables and keep the odor down to minimum. 3. Size the gallon capacity for the traffic to prevent overflow into the wrong bin. 4. Adjust the recycling bin opening size and shape to promote the targeted recyclable. For example: cans, plastic bottles, and glass bottles should be between 3 ½” and 4 ½” diameter. 5. Mark both receptacles very clear from any direction and make it readable for all heights with the proper text and Mobius symbol. 6. Educate the public of the advantages of recycling. You can do this by setting up kiosks and message centers around your facility (or on the recycle bins themselves) stating what your facility and community have already achieved with recycling. If your local school has made strides in sustainability, it’s great to include them here, as well. 7. Add a rubber baffle to the opening of the recycle bin to make it difficult to throw paper trash in the recycle bin. 8. Place bins in key locations with high-traffic for convenience. If necessary, rearrange bin placement to isolate any “trouble spots” your site may have. 9. Color code the bins using best common practices. For example, bins colored blue are commonly used for recycling. This common knowledge by now. More importantly, it’s a color that can easily be seen from a distance. 10. Use commingle recycle bins when possible; they are less confusing to the public. 11. Start with educating your visitors. Specifically, set up a community sustainability program that put money back into the community. Or invest in existing programs. Talk to your local schools, particularly K-12, and see if they have already established sustainability program. Helping kids understand the importance of recycling and minimizing litter will do wonders for keeping a clean world! Properly installed, an all-metal bench or a receptacle coated with a super TGIC polyester powder coat paint will last on average for 10 to 15 years without needing any attention other than possibly re-coating the receptacle lids that have been severely abraded from heavy use including cigarette burns. Today’s premium aerosol coatings, such as lacquers, can be purchased at your local building supply store. Premium aerosol does a credible job re-coating small areas. Buffing the affected area with a 400- to 600-grit abrasive removes the steep ridge lines along the edge of the damage, which creates a smoother area to paint. If you happen to be in a very corrosive climate and there are large areas that are deteriorating, consider sending them for a total repaint at a body shop, technical school, or possibly a corrections facility located in your area that has a paint booth. We have found this is less expensive than replacing units with new product. Basically, the steel should be deprived of air and moisture and you’ll get an infinite number of decades of service. 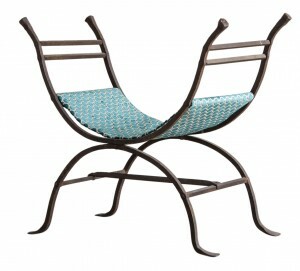 This iron curule Italian bench circa. 1875, for instance, is still going strong! 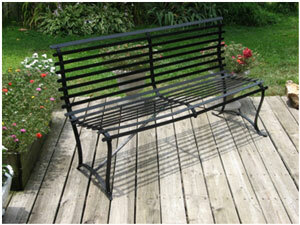 Find the Perfect Commercial Steel Benches! Visit the links below to find the perfect steel benches, planters, and trash receptacles for your needs! New Advertising Park Bench That Keeps Looking Good! Are you embarrassed by your peeling signs, splintered seats and overall unattractive advertising benches? We have the solution! Our advertising benches not only eliminate all of these problems, they are also Eco- and user-friendly! Our advertising benches exemplify OCCOutdoor’s dedication and commitment to being as Green as possible. Its frames and slats are made from mostly recycled material, like plastic milk jugs. The frames come in three different colors and the slats come in seven different colors. The sign is backed by a 3/16” thick textured ABS plastic and the sign cover is 1/8” thick UV resistant polycarbonate, designed for many years of service outdoors. Even with this durable construction, OCC Outdoors offers a fifteen-year limited warranty on the frames and slats. This limited warranty gives added peace of mind as it covers cracking, checking, and fading. The frame takes less than 5 minutes to open and insert a new sign. » and tighten the two screws. This is the solution to providing a quality park bench that will look good for years to come, with little to no maintenance, and keep your ads looking great! Need an Advertising Bench for Your Site?